VS. Cactus King is the twenty-fifth level of Donkey Kong Jungle Beat. It is the first of two levels in the Moon Barrel in the GameCube version and the first of four in the New Play Control! version. This kingdom is unlocked by beating the Durian Kingdom and collecting twenty-two crests. Donkey Kong comes here to fight Cactus King. The level begins with Donkey Kong landing in an area with two hills, with one cannon shooting in his direction. As soon as DK approaches the cannon, there will be another cannon atop a ledge, with two bananas in bubbles floating above it. There will be a wall at the end of this area, which the player must use the Helper Monkey to get on top of. Floating above the ledge will be three bananas in bubbles, but, as soon as Donkey Kong lands, three Ninjapes will appear. After dispatching them, Donkey Kong will find a ledge, which he must wall jump to get on top of, and a Helper Monkey, which will send him up to the wall, and, using the wall jump again, the player will find a Helibird, which Donkey Kong should land on upon arrival. 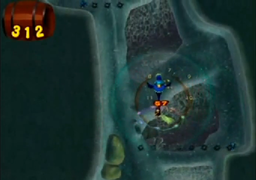 Flying up to the boss fight, the player will find several bananas in bubbles, but there will also be two blue Ninjapes, which will sit on a ledge and throw ten shurikens. As soon as Donkey Kong flies into the cave at the top of the level, he will encounter Cactus King, mounted on Boss Pig Poppo. The player must first defeat the mount by using the sound wave attack to deflect the flames it shoots back at it; doing so will daze the creature. The player can then attack the pig and as soon as Donkey Kong defeats it, Cactus King will destroy it by jumping on it, beginning the battle with Cactus King. As soon as Cactus King is defeated, Donkey Kong will receive 800 beats. After defeating the Cactus King, Donkey Kong will be transported to the ending ceremony. Here, several party monkeys will follow Donkey Kong as he travels to a large stone monument, where the monkeys will celebrate the defeat of Cactus King. When the player claps, Donkey Kong will beat his chest and holler, followed by the other monkeys hollering and fireworks going off in the distance. The screen will then fade to black and the end credits will play. * These two levels swapped positions in New Play Control! version. ** Exclusive to the New Play Control! version. This page was last edited on April 12, 2019, at 13:34.